DoD | Where is @rusnivek? This morning was busy with meetings with. Florida Governor Rick Scott and Acting Secretary of Homeland Security Elaine Duke. Acting Secretary Elaine Duke of the US Department of Homeland Security and Florida Governor Rick Scott in an interview with ABC affiliate 10News from Miami on Hurricane Irma Response/Recovery efforts in the Florida Keys. Acting Secretary Elaine Duke of the US Department of Homeland Security in the Monroe County (FL) Emergency Operations Center. All part of the hurricane Irma response and recovery specifically address to the Florida Keys. Key national leadership briefing on Hurricane Irma Response/Recovery efforts in the Florida Keys. Lots of partners and Public Safety attending as well as our partners from the US Coast Guard, US Army Corps of Engineers, Department of Defense, and so many more. Acting Secretary Elaine Duke of the US Department of Homeland Security and Monroe County (FL) Emergency Management Senior Planner discussing Hurricane Irma Response/Recovery efforts for the Florida Keys. 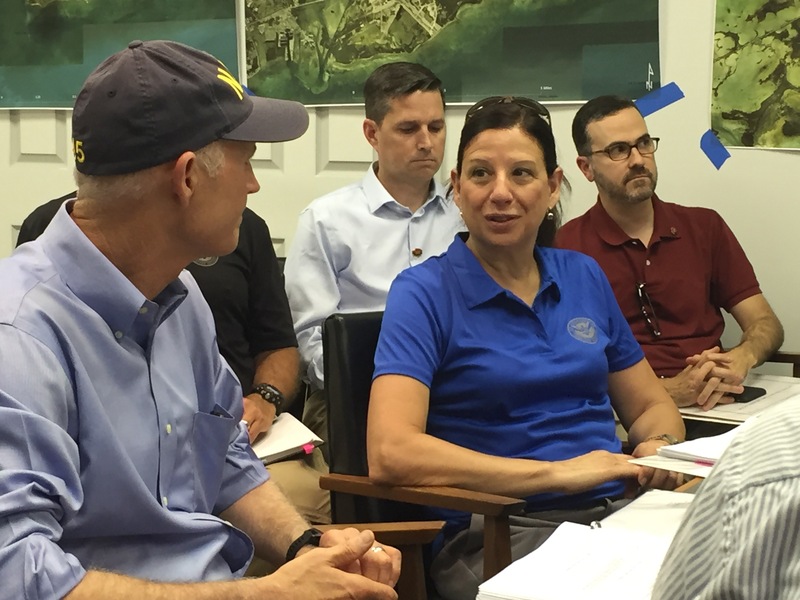 Acting Secretary Elaine Duke of the US Department of Homeland Security and Florida Governor Rick Scott discussing strategies in the Monroe County EOC on Hurricane Irma Response/Recovery efforts in the Florida Keys. Glad to see cabinet level support of our disaster here in Branch V! Numerous follow-up interviews were conducted and for me just seeing officials support our boots on the ground efforts and collaborate with so many other agencies is refreshing. DHS/FEMA Division Supervisor Mark Landry (FCO Cadre Member) briefing with Florida National Guard leadership and Marty from Monroe County Administration on Hurricane Irma Response/Recovery efforts for the Florida Keys. Here’s a sneak peek of the other side of the room with all the media. Just some of the media who were allowed in the room for Acting Secretary Elaine Duke of the US Department of Homeland Security and Florida Governor Rick Scott on Hurricane Irma Response/Recovery efforts in the Florida Keys. Fun times in such a small room! More work today as the official FEMA public information officer. Your faithful DHS/FEMA Branch V Division A PIO Kevin Sur overseeing the Acting Secretary Elaine Duke of the US Department of Homeland Security and Florida Governor Rick Scott multiple interviews in front of the Monroe County EOC on Hurricane Irma Response/Recovery efforts in the Florida Keys. Q: Why now? Has the North Korea missile threat increased so much recently that you were urged to begin preparations for an attack? Q: I have heard that planning for a nuclear attack from North Korea is futile given most of the population will be killed or critically injured. Is that true? A: No. Current estimates of human casualties based on the size (yield) of North Korean nuclear weapon technology strongly suggests an explosion less than 3 miles in diameter. More than 90% of the population would survive the direct effects of such an explosion. Planning and preparedness are essential to protect those survivors from delayed residual radiation (fallout) and other effects of the attack such as the loss of utilities and communication systems, structural fires, etc. Q: How will the public learn of a possible missile launch from North Korea? A: Approximately 5 minutes into the launch sequence, the U.S. Pacific Command will notify the Hawaii State Warning Point (SWP) that a missile is in route from North Korea. The SWP is staffed on a 24-hour, 7 day-a-week basis by skilled emergency management professionals. Upon receipt of the notification, the SWP will activate the ‘Attack-Warning’ signal on all outdoor sirens statewide (wailing sound) and transmit a warning advisory on radio, television and cellular telephones within 2 minutes. Q: What should Hawaii residents and visitors do when they hear the ‘Attack-Warning’ siren signal? Q: Was the recent public messaging recommending that each individual/family maintain a 14-day survival kit made because of the North Korea threat? Q: When will schools begin nuclear drills? A: Schools are not expected to conduct drills specific to a nuclear attack. Existing drills known as ‘lock down’ drills serve the same purpose. These drills are regularly conducted at all schools statewide and are considered more than adequate in terms of protecting students and staff. Q: When will the new ‘Attack-Warning’ siren signal will available and how will it be tested? A: The new (second) ‘Attack-Warning’ siren signal (wailing sound) will be available for use beginning in November 2017. The signal will be tested on the first working day of every month thereafter together with the existing ‘Attention-Alert’ signal (steady sound) used for other emergencies. Q: Are there public shelters (blast or fallout) designated in our communities? Q: How long will residents and visitors need to remain sheltered following a nuclear detonation? Q: How can I tell if nuclear radiation is present? Q: How long will nuclear radiation persist after a nuclear detonation? Q: Are the neighbor island safe? A: We do not know. North Korean missile technology may not be adequately advanced to accurately target a specific island or location. Although most analysts believe the desired target will be Oahu given the concentration of military and government facilities, a missile may stray and impact the open ocean or even a neighbor island. All areas of the State of Hawaii must consider the possibility of missile impact. A: When a nuclear weapon detonates, one of the direct effects produced is called an Electromagnetic Pulse (or EMP). EMP has the potential of destroying electrical devices and telecommunications systems. It may also disrupt electrical power and other essential utilities. Broadcast stations many miles distant from the explosion (such as on another island) will survive EMP effects. Our current plans are to utilize AM and FM broadcast radio stations on unaffected islands to provide essential information to the public. This means residents and visitors should include a battery-powered AM-FM radio in their 14-day survival kit. Q: How can I learn more about the nuclear threat and preparedness? A: Public outreach and online information is available to all Hawaii residents. or contact your county emergency management agency.